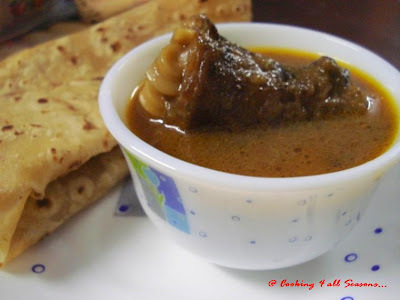 Cooking 4 all Seasons: Aatukal Paya ~ Mutton Paya! I guess Paya is something my hubby dear is very fond of. He always tells me about the Mutton Paya that he used to eat in Hyderabad. He stayed in Hyderabad for a year or so. Since he lived on his own, he was eating at the hotel and he frequented all the nook and corner of the city. Even after all these years later, he makes sure he drops in those joints when he happens to visit the city. On knowing that Paya was his favorite dish, Amma tried making it once, after getting the recipe from our family friend. Well I don't know if he liked it or not. I just knew she made once for him. It was forgotten for many years. Though he does talk about it. Recently he again remembered and said I should make it for him. So I again asked Amma for the recipe. She said those many years ago, was the first time for her and the last. Dad kind of, didn't like it much and she has also forgotten if hubby dear liked it or not. Still I thought it will be good. so noted down the recipe. And was all ready to venture into it. Then I remembered our Muslim friends. They knew me since I was 5 year old. He used to report to Dad and those many years ago, we used to live in the same town. The relationship grew to a much different level and I glad to have them as our close family friends. Aunty makes the yummiest biryani and of course Parottas. During our initial months of marriage, they invited us for a visit and thats where I saw Aunty preparing those parottas, from which I have modified and arrived at my own! She is one great cook. 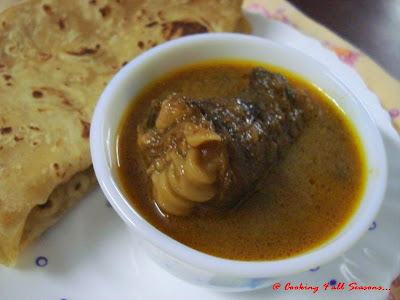 So when a need for a Paya recipe came to mind, I thought of her and promptly called her for the recipe. She said she makes it the previous night and they eat this as soup the next day morning. I made it in the afternoon and served it for dinner. Hubby dear wanted Parottas, but I couldn't make. I was really glad, when he was spellbound on the taste. He said he came out really so delicious. I am really glad that I asked her for an authentic Muslim Paya recipe. Next on my list will be her Mutton Biryani. Though Aunty didn't mention Mint leaves, I added them for flavour. In the end, it was very tasting good. Wash the bones well and keep aside. Make a paste of Onions, and saute in a pressure cooker. When the paste turns pink, add the ginger garlic paste, chopped green chillies. Fry well. Then add the mint and coriander leaves, saute for 1 min. Then add the chopped tomato. Add salt. Simmer for 5 mins, so that it becomes soft. Add all the spice powders and mix well. Finally add the bone pieces and simmer for 5 mins. Add 1 - 2 cups of water and cover the cooker and put it on for 5 -6 whistle. Allow it to stay that way for atleast 6 hrs. Note: Chop the chillies if you don't want it so hot, else slit the chillies. Adjust the pepper and chillies for the spice. I was told that red chilli powder and coriander powder will not be added to the paya. And this is normally made overnight and eaten the next day. If you want to eat the same day, then let it rest atleast for 6 -7 hrs. Check out my busy co runners, busy with their recipes for today!